Regardless of the area of the country that you call home, you will at some point in your life deal with a pest control issue. That being said, if you live in West Palm Beach County or its surrounding areas, you are more than likely to have an infestation at some point in the coming years. Here in South Florida, the hot and humid environment is quite appealing for a number of pests that once did not call our area home. Native Pest Management, your local West Palm Beach pest control services provider, offers a number of pest management services to the people of West Palm Beach County, Boynton Beach, Delray Beach, Jupiter Beach, Wellington, Palm Beach Gardens, Lake Worth, and Boca Raton. In our first blog post, we would like to discuss a few things about our pest control company, as well as some of the pest control services that we offer to the South Florida area. Here at Native Pest Management, we practice integrative pest management (IPM) services, rather than traditional pest control services. Whereas in traditional pest control a heavy focus was made on the use of powerful pesticides, integrative pest management is a more holistic approach that not only addresses the act of getting rid of the pest but also to ensure that the pest does not return to your home or business. Integrative pest management is an ecosystem-based strategy that focuses on the long-term prevention of the damages caused by pests using a culmination of pest control techniques. By using methods of pest management and prevention like biological control, habitat modification, and the use of pest-resistant materials, integrative pest management addresses a pest control issue with a holistic approach. Integrative pest management is an effective, and proven, method of pest control, and our pest management company stands by it. If you have any questions about our pest control methods, or how they could be applied to your pest control issue, we urge you to contact us today. 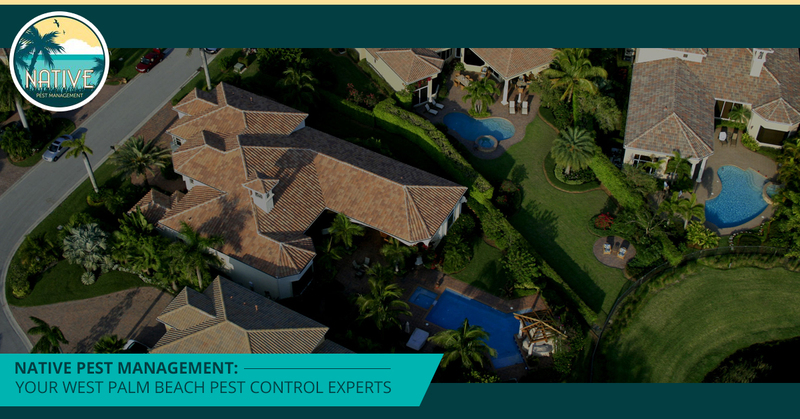 As a pest management and pest removal company here in West Palm Beach, we offer a number of pest control services ranging from pest extermination to lawn care services. All of our services take on a holistic pest treatment approach, both ensuring that the pests are remove, and that the pests do not return. Below, we have listed a few of the pest management services that we offer, as well as brief descriptions of each service. Mosquito Control – Mosquitoes are a nuisance pest that can both disrupt your evening of relaxing outside, as well as potentially carry dangerous diseases and viruses. Our team of pest control experts have the tools and knowledge to prevent the reproduction of mosquitoes on your West Palm beach property. Cockroach Control – Cockroaches are attracted to South Florida because it reminds them of the tropical environments that they originated in. If you have a cockroach infestation, your local pest control experts at Native Pest Management will make sure to remove them from your home or business. Ant Control – Sugar ants and ghost ants are a huge nuisance pest in our area. Their ability to move their colonies quickly in response to danger makes their removal a job for the experts. Out team of exterminators will both remove the ants from your home, as well as ensure that they do not return. Rodent Control – Rodents can be more than just a nuisance in your home or business. Not only can they carry diseases, but they can also directly challenge and damage the structural integrity of your home. Getting rid of rodents, as well as to keep them from returning, is as easy as working with us at native Pest Management. Termite Control – Termites can be extremely damaging to your home, making it important that an exterminator is contacted as soon as you notice signs of termites. Our team of termite control specialists can help you rid your home of termites today. Bed Bug Control – Bed bugs are evasive and their presence is usually only known after the person on the affected bed becomes bitten. Don’t get bitten any more than you have to, let us help. Lawn Care & Pest Control – Your yard is your sanctuary, and sadly, full of pests. Let us take care of your lawn to ensure that your landscaping remains healthy and pest free. As you know, there is no shortage of pests in South Florida, especially here in the West Palm Beach area. Because of this, it is crucial to be vigilant of the pests in, or around, your home and to contact us here at Native Pest Management as soon as you notice an issue. Our team of experienced pest removal specialists can aid you in removing the pests, as well as ensuring that the pest is unable to return. Because of the nature of our non-invasive integrative pest management systems, you can rest easy knowing that your home is safe and pest free. So what are you waiting for? Stop searching terms like “exterminators near me”, or “pest control West Palm Beach.” Pick up the phone and call us at native pest management, or contact us online to request a free quote. We look forward to helping return your home or business to the safe and worry-free environment that you deserve for it to be.